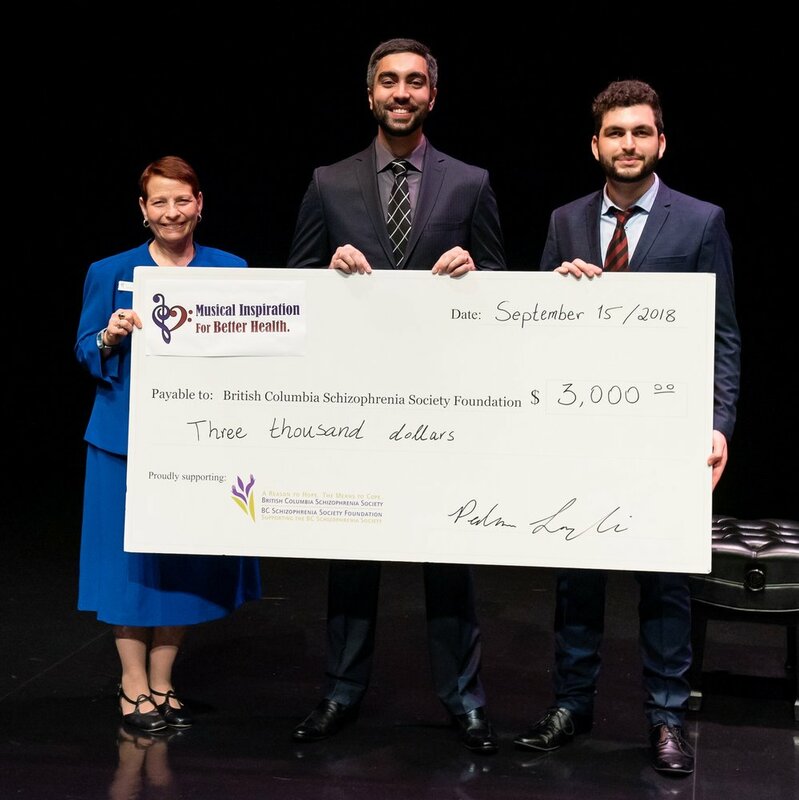 On September 15th, 2018, Music For The Hearts Organization hosted its special 5th annual musical concert at the grand, prestigious centre for performing arts in Coquitlam - Evergreen Cultural Centre. With the collective efforts and participation of 36 talented volunteer musicians/performers, 13 dedicated volunteers, 28 financial and food sponsors, and over 150 guests, the committee was pleased to have raised a net amount of $3,150 for British Columbia Schizophrenia Society (BCSS). For the second year in a row, the MFTH team unanimously decided to benefit BCSS, a non-profit organization committed to supporting individuals and families affected by severe mental illness. All of the donated funds will be used to directly help affected families, educate the public about schizophrenia, and contribute to research and awareness for better medical services. MFTH Organization sincerely thanks Soltani Music School and Westwood Alliance Church Children's Choir for contributing countless amount of hours preparing and coordinating their breath-taking performances. Both of these groups have graciously supported MFTH for multiple years. Additionally, the organization thanks other brilliant musicians that were independent of these groups, namely Mahsa Movahedan, Gina Zoleikhapour, Yasaman HF, Oliver Lee, and Ava Nejad. Mrs. Fariba Kaheh, Dr. Maria Gholami, Dr. Inna Fadyeyeva, Dr. Hamid Tabassi, Dr. Mehrtash Amini, Dr. Jamal Majd @ Bright Dental Clinic, Westwood Honda, Total Eye Care Centre, Green Family Wellness Centre, Best Way Heating, Pasta Polo & Brick Oven Pizza, Browns Social House near Coquitlam Centre, Jamila's Kitchen & Grill, Cactus Club @ Coquitlam, Freshslice Pizza at Port Moody, Coquitlam Grill, COBS Bread at Suter Brook, COBS Bread at Sunwood Square, Starbucks Coffee, Menchie's Frozen Yogurt, Haida Sandwich @ North Vancouver, Save-On-Foods, Real Canadian Superstore, Safeway, Thrifty Foods @ Port Moody, The Body Shop @ Coquitlam Centre, Ashton Lane Hair Company @ Coquitlam, and Cineplex Entertainment @ Coquitlam. The committee especially thanks Mrs. Fariba Kaheh and Dr. Maria Gholami, as they both have financially supported MFTH since its inception as an organization. Additionally, the organization especially thanks the inspiring and admirable guest speakers of the 5th annual event that shared their personal stories and explained how important it is to be aware of mental health: Mayor Richard Stewart of Coquitlam, Dr. Randall White, and Mr. Renato Zane. Many thanks to Abhijeet Kamble, Amanda Hoang, Arushi Suneja, Blessy Raju, Bruna Machado, Chris Hickman, Iris Nuñez, Ivy Joseph, Justin Becker, Matthew Kim, Ruzni Hanifa, Shahkar Raja, Sylvia Foran, and Tyson Yau for being dedicated and committed volunteers of the event. All of these hardworking individuals put a great amount of effort into making the event run smoothly. The committee also extends their gratitude to the dedicated volunteer photographers, Amir Ebadati and Joanna Lu who have helped capture amazing pictures through many years. And last but not least, the team is grateful toward Patricia Santos for being MFTH’s volunteer graphic designer. She has contribute many hours in designing multiple elements of MFTH for its 5th annual event and past events.